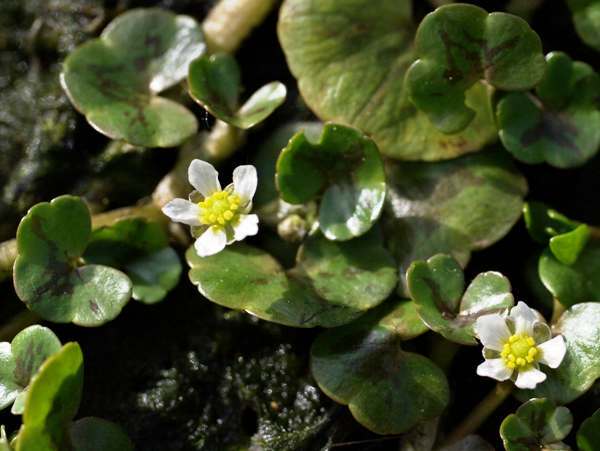 Found mainly in shallow streams and ditches, and sometimes in shallow ponds and puddles, this creeping plant blooms from April to September and has tiny flowers a quarter the size of those generslly associated with river ranunculus species. There are several similar species, including ivy-leaved crowfoot, all of which have a preference for still or slow-flowing shallow water. The plant shown on this page was photographed on the River Teifi in West Wales and is one of the reasons for the River Teifi's designation as a Site of Special Scientific Interest is its diversity andabundance of Ranunculus species. The photograph was taken in July.